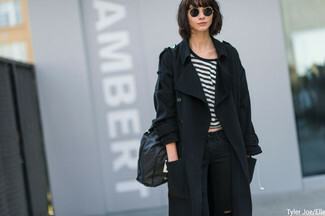 If you're in search of a casual yet totally stylish outfit, marry a black coat with black skinny jeans. Both garments are totally comfy and will look fabulous paired together. A pair of brown leather lace-up flat boots will be a stylish addition to your outfit. For a neat-meets-totally stylish look, choose a black coat and navy vertical striped dress pants — these two pieces play beautifully together. When it comes to shoes, this getup is finished off perfectly with black leather tassel loafers. As you can see, looking stylish doesn't take that much time. Just go for a black coat and you'll look amazing. Break up your getup with more casual shoes, like this pair of black leather lace-up flat boots. 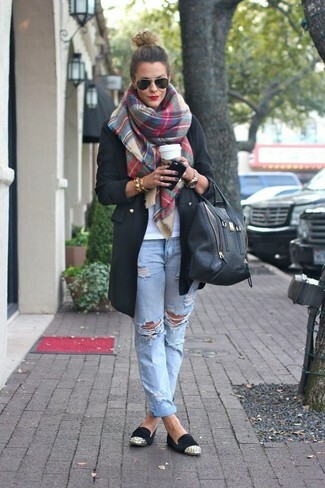 This pairing of a black coat and navy skinny jeans is effortless, chic and oh-so-easy to recreate! When it comes to shoes, this getup pairs wonderfully with black leather ankle boots. A Junya Watanabe split sleeve wool blend coat and light blue ripped boyfriend jeans is a wonderful combination to add to your casual repertoire. Sporting a pair of black embellished suede loafers is a simple way to add some flair to your getup. 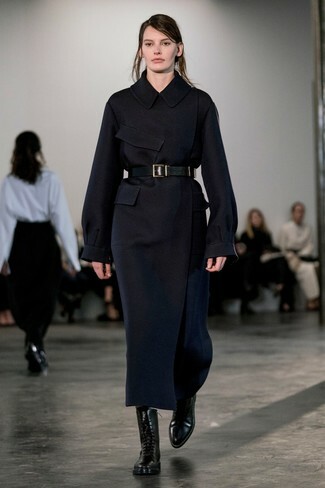 If you enjoy a more relaxed approach to fashion, why not dress in a Junya Watanabe split sleeve wool blend coat and a black midi dress? Finish off this getup with white and black leather pumps. 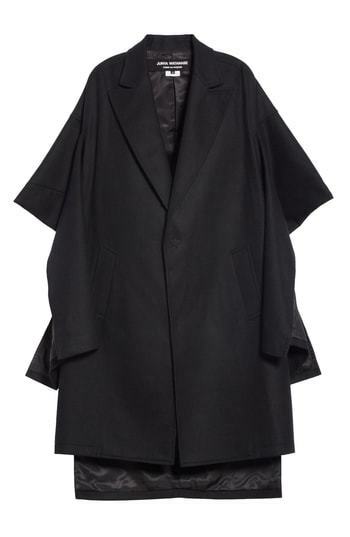 If you're on a mission for a casual yet stylish ensemble, pair a Junya Watanabe split sleeve wool blend coat with black ripped skinny jeans. Both items are totally comfy and will look fabulous together. Try teaming a Junya Watanabe split sleeve wool blend coat with a teal mini skirt for both chic and easy-to-wear look. When it comes to shoes, this ensemble is finished off well with black leather lace-up ankle boots. If you're on the hunt for a casual yet chic ensemble, try teaming a Junya Watanabe split sleeve wool blend coat with a grey print crew-neck sweater. Both garments are totally comfy and will look fabulous paired together.